Most countries in the world spend a sizable amount of public fund on health, though delivery of health services is organised through a mix of government and private providers. The countries recording high level of public spending in health have secured better health outcomes compared to the countries with low spending, barring few exceptions like the US, where high public spending co-exists with high exclusion. Some however have also managed better outcomes with little public funds while improving allocation of funds, better management and effective service delivery mechanisms (NCMH, 2005). India’s performance in improving the health outcomes, even after announcement of more than 21 committees and commissions on health sector reforms, has remained far from satisfactory levels. For instance, some of the health outcomes (infant, child and maternal mortality rates) are not only lower than the Millennium Development Goal targets but even worse than some of the developing countries. The infant mortality rates (IMR) of India is around 54 whereas Sri Lanka's IMR is 17 (WHR, 2010). The life expectancy at birth (64 years) of an average Indian is at least 15 years lower than that of developed countries and even lower than the neighbouring Sri Lanka (74 years). Almost half of Indian children suffer from malnutrition which is even worse than what recorded in some places in Sub-Saharan Africa. More than 50 per cent of women suffer from anaemia (WHR, 2010). The rural-urban gaps in health outcomes are not only persisting but have widened over the years. In order to understand this unsatisfactory performance in the health sector, one needs to look at the gap between health policy commitments by the government and the allocation of funds in respective segments. 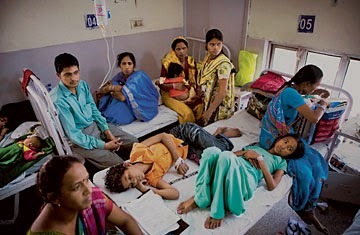 Since independence, India followed a welfare state approach with healthcare falling under the auspices of the government. Healthcare was supposed to be the responsibility of central and state governments, particularly in determining priorities, financing and delivery of health services to the general population. The recommendations of first Health Planning and Development Committee (Bhore Committee, 1946) report, that emphasised the development of basic infrastructure and manpower, were taken up in the First (1951-56) and the Second (1956-61) Five-Year plans of India. Data shows that prescribed norms of health infrastructure could not be met even after sixty years of independence, in 2010. Under the Community Development Programme (1951-55), India formulated a plan to achieve one PHC (Primary Health Centre) per one lakh population, but the achievement is around one-fifth (one PHC per 5.5 lakh population) of the targets set for the year 2010. Surprisingly, based on the recommendations of various committees and Alma-Ata declaration (1978), India announced its first formal National Health Policy (NHP) in 1983. NHP pledged to achieve ‘Health for all by the year 2000’, the primary vehicles conceived were introduction of certain numbers of CHCs (Community Health Centre), PHCs and SCs (Sub-centres) in the country. A shortfall of 4372 CHCs, 1875 PHCs and 10992 SCs was noticed in 2001. Furthermore, as per Indian Public Health Standard (IPHS), there should be 4-6 beds and 30 beds in each PHC and CHC respectively. In 2010, only 59 per cent of the PHCs and 72 per cent of the CHCs could achieve the prescribed standard. Thus the physical and human infrastructure in the health sector in India grossly falls short of the prescribed norms. The second National Health Policy which was announced in 2002, itself recognised that the performance of first NHP is unsatisfactory particularly because of low level of government spending. The second NHP recommended that government spending in health should increase (i) from its existing level from about 0.9 per cent of GDP to 2 per cent of GDP and (ii) from existing level of about 5.5 per cent of total budget spending to 8 per cent of total budget spending by the year 2010. In 2010, the level of spending recorded to be around 1.09 per cent of GDP which is significantly lower than the commitments. In 2004-05, the National Commission of Macro-Economic and Health (NCMH, 2005) of India estimated required level of resource that need to be spent by every state government to meet the adequate level of basic health services in the country by the end of 2009-10. An analysis of the required level of resources against the actual allocation shows that most of the state governments could not achieve the prescribed level of health spending during the specified period. Except for Himachal Pradesh, there exist high gaps between required resources and actual spending in most states (Figure-1). Such gaps in resource requirements were not only noticed in low income states like Bihar, Orissa, Rajasthan and Uttar Pradesh but the high income states like Punjab and Maharashtra could not maintain the required level of spending. In 2005, central government launched a flagship programme called National Rural Health Mission-NRHM. The Mission has set an ambitious goal of increasing in government spending in health to 2-3 per cent of GDP by 2012. But spending remained 1.2 per cent of GDP at the end of 11th Plan (2012). Even after adding the expenditure of complementary (water supply and sanitation) services, the spending hovered around 1.6 per cent of GDP which is less than the commitment. The failure in various policy commitments reflects that India, despite having low health outcomes fails to allocate resources that increase provisions for health care. Overall, neither the Primary Health Care approach, ‘Health for All’ targets nor the spending commitment ever been implemented and fulfilled in the country. This reflects that health has always been a low priority sector in India. Recently, the High level Expert Groups (2012) on Universal Health Coverage has proposed to increase the government (central and state combined) spending in health from the current level of 1.2 per cent of GDP to at least 2.5 per cent by the end of the 12th Plan and to at least 3 per cent of GDP by 2022. Past experience however leaves little hope in fulfilling these commitments. As per the Constitution, health is a state subject in India. The state governments would deliver adequate health services to meet the health need of the population. The central government, however, can directly intervene in establishing major hospitals and to assist medical education and research. Another way to intervene in health sector by the central government is to initiate Central Plan (CPS) and Centrally Sponsored Schemes (CSS), which are generally implemented through state budgets. Thus the responsibility of fulfilling the health needs of the population is largely being shifted to the state governments. In 2005, it was realised that there is high gap in health outcomes and facilities across Indian states. In order to fill such gap, the central government, under the NRHM, identified states with high fertility and mortality rates and otherwise. The former states were named as high focused states-HFS (namely Assam, Bihar, Himachal Pradesh, Madhya Pradesh, Orissa, Rajasthan and Uttar Pradesh including north-eastern states) and the rest are non-high focused states (Non-HFS). Under NRHM, the promise was made to devolve/transfer more central funds towards HFS to remove variation in health spending across states and to ensure better (up to the MDGs) health standards in the country. Evidence however shows that the share of fund allocation remained lower than the commitments made by central government. Surprisingly, the ratio of actual fund allocation to commitment – a high ratio reflecting low priority - found high (around 18 percent) in high focused states as compared to around 15 percent in non-HFS. Even though it was mandated that the priority should be accorded to high focused states, the outcome was the opposite. Under NRHM, under fund devolution criteria, the central government asked the state to increase their own spending at a specified rate in tandem with increased central funding. It was found that state governments are failing in their capacity to absorb the funds that are allocated by central government. The share of unspent amount with the state as a ratio of total funds released by central government is recorded around 6.4 per cent and 12.5 per cent for high focused and non-high focused states respectively, indicating inadequate absorptive capacity of states to utilize the fund properly. The absorptive capacity however found to be high in high focused states compared to the non-high focused states which seem to be a positive indication. The fund absorptive capacity is noticed to be highly inadequate in West Bengal and Punjab, where around 56 per cent and 48 per cent of the funds respectively have not been utilized. It can be argued that lack of inadequate availability of human resources, weak capacity to plan and execute plans are plausible reasons for the state governments failing to absorb the central fund adequately. One interesting observation is that the direction of funds transfer from centre to state has changed significantly with the implementation of NRHM. Specifically, some of the central government funds, which were earlier routed through state budget under the centrally sponsored schemes (CSS) and plan schemes (CPS), now bypasses the state budgets and are designed to be implemented through state implementing agencies like State Health Society. Note that the central transfer to states through CSS/CPS is an important policy initiative of the central government to support various health programmes running in the state. This helps in meeting the recurring and non-recurring requirement of these programmes, especially the programmes related to communicable and non-communicable diseases such as trachoma, blindness control programmes, family welfare programmes and the others. With this changing route of central transfer not only it becomes difficult to comprehend the total government (centre and state) health expenditure but also entails larger implications for health programmes initiated by central government. Interestingly central government spending on CSS and CPS taken together declined from 0.16 per cent of GDP in 1990-91 to 0.08 per cent of GDP in 2004-05 (Figure-2). This declining share has reduced the budgetary resources provided for dealing with several existing major communicable and non-communicable diseases and family welfare programmes. This raises the question of sustainability of some of the health programmes. Ideally, the long-term sustainability of any one or all of these central sponsored health programmes, to a large extent, depends on continuous funding from central government. The declining trends or uncertainties in resource flows from centre to state would certainly affect the implementation process and effectiveness of these programs at the state level and more particularly the needy (poorer) states. This probably indicates that state governments have to bear most of the burden of health expenditure to finance these programmes from their own resources. The central spending on NRHM components that are supposed to be bypassing the state budget and implemented through state’s autonomous agencies as per cent to GDP has increased during the period 2005-06 to 2008-09 (Figure-2). The increasing trend in health expenditure under NRHM, routed through decentralized agencies, raise doubts about how the implementing agencies will utilize the transferred funds. As regards to the sustainability of central sponsored (CSS/CPS) programmes, it has been realised that NRHM consists of some new schemes but repackages many of the existing health schemes which are now bypassing the state budget. For instance, the National Disease Control Programmes (NDCP) which was earlier with the Department of Health has now been made part of the NRHM. Similarly, the earlier schemes of the Department of Family Welfare such as reproductive and child health programme (RCH), immunisation, contraception, information education and communication (IEC), training and research, area projects and other family welfare services, are all included in the NRHM. The new initiatives under the NRHM are mostly financed through what is called the ‘mission flexible pool’ which provides for activities like selection and training of a new cadre of community health worker called Accredited Social Health Activist (ASHA), up-gradation of health facilities (community health centre and public health centres) to first referral units (FRU) and facilities meeting the new Indian Public Health Standards (IPHS), constitution of patient welfare committees called Rogi Kalyan Samiti (RKS) and district hospital management committees, mobile medical units, united funds for sub-centres, preparation of district action plans and so forth. There have also been some changes in the centrally sponsored schemes now falling under the NRHM umbrella. The earlier RCH programme (RCH1) funded a fixed set of activities. Under the NRHM, the earlier form of the RCH programme is being phased out. In RCH2, most activities are funded through an RCH flexible pool which supports decentralized planning and flexible programming by the states (NRHM, 2005). All these show that NRHM includes many schemes covered under the CSS/CPS. A study of expenditure on different components of NRHM throws some light on the sustainability of earlier programmes sponsored through CSS/CPS. The NRHM mission flexible pool, which provides much of “new” funds to the states, accounted a higher amount and shows increasing trends as per cent to GDP over the period, except for the recent years. Its share in compositional term has also increased from 13.2 per cent in 2005-06 to 35.2 per cent in 2012-13. The RCH flexible pool, which provides the greater flexibility to states spending on RCH related activities, has also constituted higher amount and show increasing trends as per cent to GDP. In compositional term its share increased from 17.6 per cent in 2005-06 to 26.4 per cent in 2012-13. The expenditure on maintenance of infrastructure however was on high priority at the time of launch of NRHM. These components constituted higher amounts as per cent of GDP in 2005-06 but started declining thereafter. In compositional term, its share stood around half of the NRHM funds (about 46.9%) in 2005-06 but declined to 33.3 per cent in the year 2012-13. One of the possibilities of decline in expenditure of these components is that central government has allocated funds on condition that state governments need to increase their own spending at a specified rate in tandem with the increased central funding. Inadequate absorptive capacity of state governments probably has come in the way that expenditure on these components has not been increased. As regards to the programmes relating to NDCP, the expenditure from these programmes, in composition term, declined significantly from 14.4 per cent in 2005-06 to 4.5 per cent in 2012-13. Similar trends are reflected in case of pulse polio programmes which raises question of sustainability of these programmes. Therefore, it can be argued that overall increment in expenditure on NRHM components is positive for health sector but the changing pattern of health expenditure, through different routes raises issues of sustainability of some of these programmes and has also made health expenditure more opaque. It can also be argued that increased funds passing through state implementing agencies were expected to improve the delivery system of health services in the rural areas. The outcomes however do not show what was expected rather the sharing of public health responsibilities between centre and states have made the process even more cumbersome. The public expenditure on health in India is one of the lowest amongst the many developing countries and from the international standard of spending. A low level of government spending on health sector seems to be a generic problem in India. The individual states were also unable to meet even the minimal level of resource requirement for maintaining/ providing the basic health facility in the country. It has been realised that neither centre nor the state governments have ever fulfilled their commitment of health spending. This has resulted in inadequate provisions of health facility in the country, e.g., bed: population ratio in India is 1:1000 compared to the 7:1000 in developed nations. This has further resulted in high (71%) out-of-pocket spending which is met out from individual’s pocket. 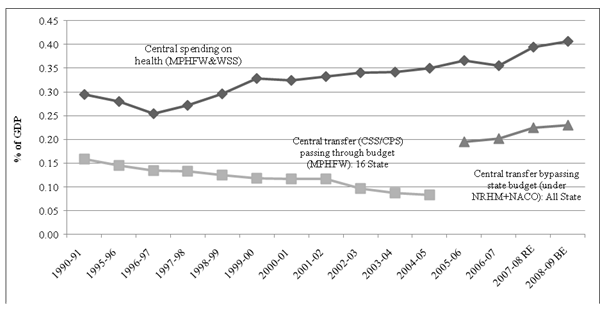 The expenditure on health however shows little increasing trends especially after the implementation of NRHM in 2005. But spending level (1.2 per cent of GDP) recorded lower than the ambitious commitments of increasing in the government health spending to 2-3 per cent of GDP by the end of 11th plan. Under the mission, the central government however has asked the state governments to increase their own spending at a specified rate in tandem with the increased central funding. The state governments however did not increase their spending at the required level. Therefore, the transfer of central funds to state, which was based on some conditionality, could not be utilized by the state governments adequately. This is being reflected by the inadequate absorptive capacity of state governments to utilize funds properly, which further result in slowing down the NRHM implementation. Probably, lack of availability of human resources, weak capacity to plan and their execution probably limits the state governments to absorb the central fund adequately. Another feather of NRHM was to transfer some of the central funds, which were earlier routed through state’s budget (through Centrally Plan and Sponsored schemes-CPS/CSS) are now transferred to states through state implementing agencies which bypass the state’s budget. This changing route of central transfer has put limitations on certain central sponsored health programmes running through CPS/CSS. It was noticed that central transfer through CPS/CSS were declining which results in discontinuity of some of the health programmes running in the villages like the pulse polio and national disease control programmes. This bypassing nature of central transfer can probably lead to disincentives to mobilize funds from state’s own exchequer. The states might think that NRHM is a financial responsibility of central government. Secondly, it is difficult to monitor the central funds passing through state implementing agencies and see whether these funds have been implemented effectively at the ground level. Further, with this changing route of central transfer, the financial relationship between centre and state in a federal structure becomes unnecessarily complex. The overall analysis confirms that India and its states are shying away from fulfilling its constitutional commitment of ‘Right to Health’ for its citizens. We observed that public health sector has never been given adequate resources to perform well in India. Given the low level, declining and fluctuating behaviour of health expenditure over the last twenty five years, it is not surprising that the health sector performance had not been satisfactory. The failing nature of better health outcomes however can easily be reversed with increased allocation in this sector. Specifically, India needs to double or triple its health spending from its existing level. Along with the commitments of health spending, it becomes important to ensure that the allocated additional public funds get spent effectively across its constituent states. The author is Assistant Professor at the Institute for Studies in Industrial Development, New Delhi.